I have no idea why I’ve postponed playing Hellblade Senua’s Sacrifice for as long as I have, but fear not: this sin has been rectified! 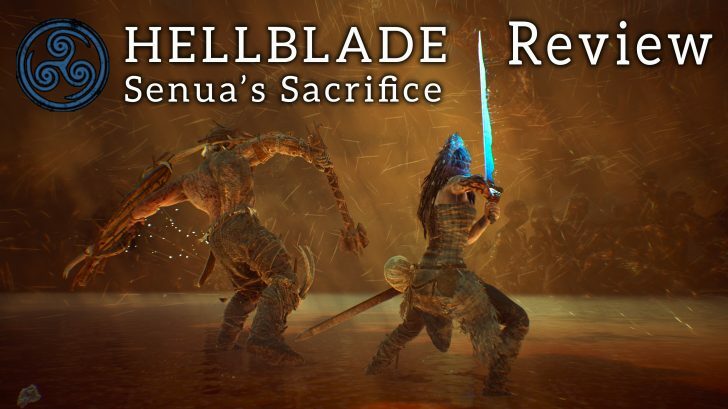 Hellblade originally released for PlayStation 4 and Windows. 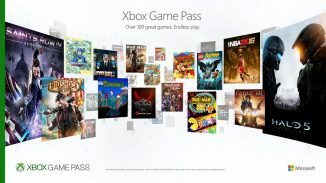 It has since gotten a port to the Xbox One, with Ninja Theory even being acquired by Microsoft shortly after. This year the title makes it to yet another platform: the Nintendo Switch. With it being playable on all major platforms, no one rightfully has any excuse to not play this gem which transcends the definition of an “indie title” with its stellar production values. 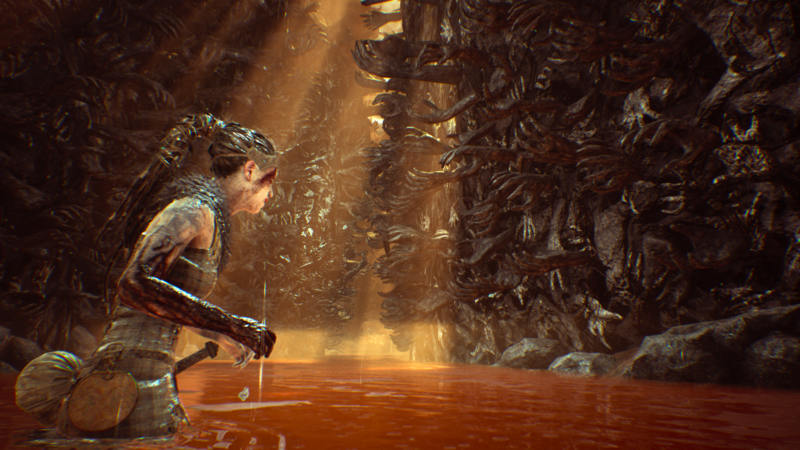 Hellblade has accrued many awards since its release as well and I was truly excited to discover if they were well deserved. Spoiler alert: they are! Senua isn’t even all that old yet but when the game starts she already has a troubled past behind her and an even more terrifying future. She has vowed to herself to redeem her lover’s soul and for this, she’s willing to travel to Helheim, the Viking version of the afterworld. 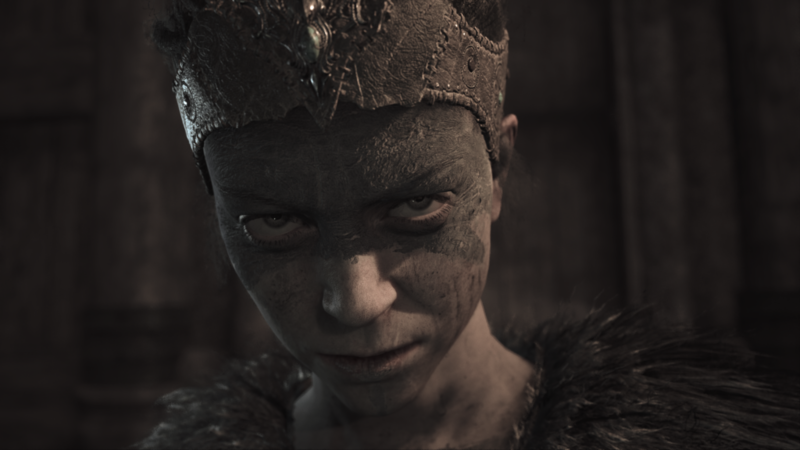 What makes this trip so daunting (and at the same time extremely memorable for us as the player) is that Senua is suffering from psychosis; she hears voices in her head that compel her to perform certain actions and she sees things others cannot. This creates an interesting doubt in the mind of the player: exactly which part of what we are experiencing is indeed supernatural powers at work and how much is she imagining? When it spreads to your head, you’ll be dead. You would assume this means that you only get a few retries in the game and that eventually, you’ll die for real and your savefiles will be wiped. Luckily, it’s just another method for the devs to make you feel uneasy. Rest assured that you won’t actually have to start over from the start. 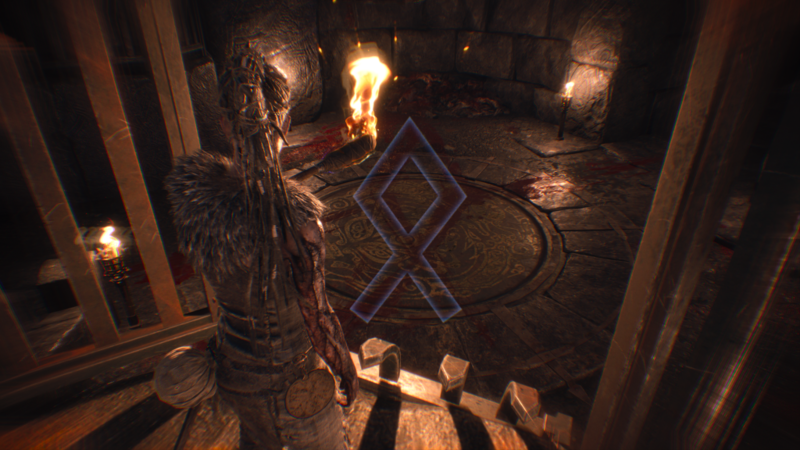 Progressing through the game follows a set pattern; you move towards the next goal and on the way you get blocked in your path by enemies or a gate requiring you to collect runes for it to open. Let’s talk about the latter first. 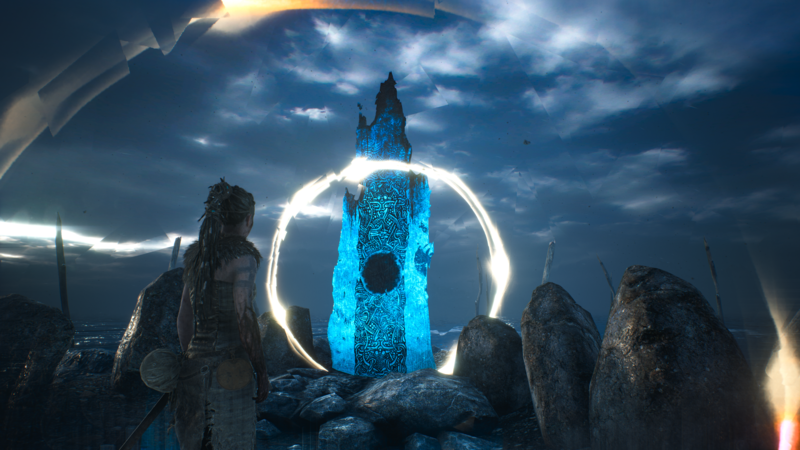 When you arrive at certain gates, red runes light up on them and Senua has to walk around in search for them. They are present in the game world, but usually only visible from a certain angle or hidden by clever perspective-based puzzles. Luckily for Senua, the janitor hasn’t been by yet. Halfway through the game, the voices raise a doubt that you shouldn’t even be bothering with them at all: isn’t this just another ruse or symptom of the psychosis? Perhaps you could just push the doors open but you’ve put up a mental block yourself, making you go through meaningless motions. I haven’t had mental health issues myself (that I know of) but I could really relate to this: As a kid I made myself believe I had to turn on the light in the bathroom and then wait a few seconds before entering (giving any monsters that may have been inside ample time to hide). The puzzles themselves aren’t really that hard once you figure out that you’ll get a visual clue when you’re near the rune. Early on I struggled more because I thought I was seeing runes pretty much everywhere but I just wasn’t in the right location yet. One other recurring roadblock you’ll have to face are the Northmen. Towering Viking warriors that come in a few variations and want nothing more than to chop Senua into bits & pieces. 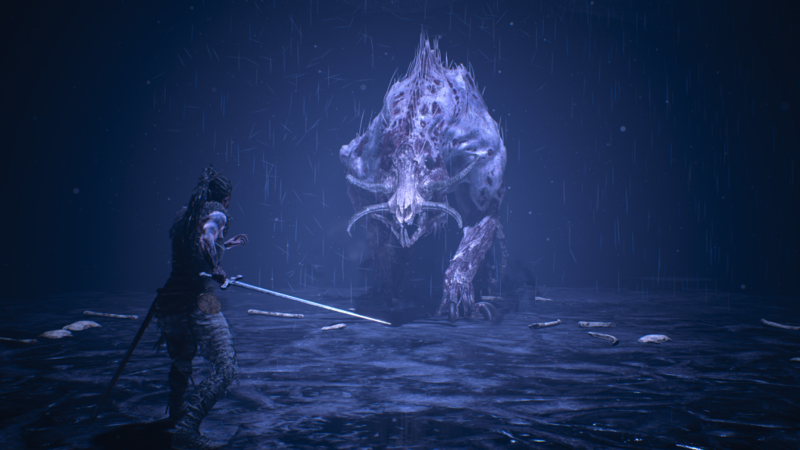 The combat in Hellblade feels really satisfying when you get a good tempo going and while the varying enemy types come at you with differing tactics, I quickly found myself spamming the dodge button and then using the same combo to finish them off. You have the expected fast attacks vs heavy attacks which you can chain into each other. A kick to drop their guard or make them back off (preferably off a bridge!) an evasive manoeuvre and a block which can be timed into a well-placed counterattack (which I should have used way more often to be honest). 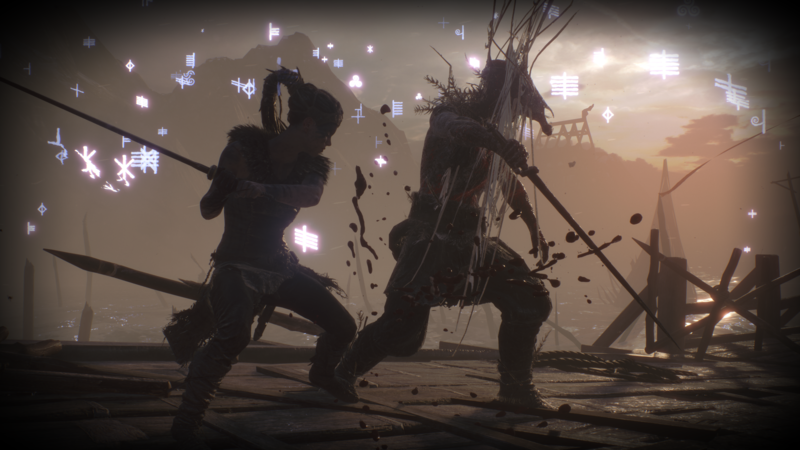 The only thing I really missed was total freedom of movement: as soon as combat starts, Senua enters a slow-moving fighter’s pose and she sidesteps around the targeted enemy. You can’t really run away to get some distance between you and yet positioning yourself in these tiny arenas is key to survival. What really sells the combat though, is the focus attack you can build up; it slows down enemies and makes your attacks significantly more powerful. When you succeed in killing a big specimen and then rush into a few run-of-the-mill baddies to slice them with a few quick combos…so, so satisfying! The formula does threaten to go a bit stale near the halfway mark, but luckily it keeps introducing just enough new elements to keep things interesting. When you have to reassemble broken shards of a blade into a god-slaying weapon, you have to overcome truly terrifying challenges. One of them requires you to play through the chapter in complete darkness, using your other senses and the voices guiding you (or misdirecting you if you listen to the wrong ones). I haven’t felt this sensation of dread since playing Amnesia: The Dark Descent. This is one-fourth of the sword? Are you sure you’ll be able to wield it, Senua? Or another that involves light where a monster will kill you if you stay in the shadows for too long. Keeping your torch lit in this chapter is extremely important as it keeps the beast at bay (though one wonders what kind of hellspawn could be scared by a little flame). Obviously the game will extinguish it at certain points to raise the tension again. I found it to be a bit of a shame you can’t just use obvious solutions. Saying the audio in Hellblade is stellar isn’t exactly letting the cat out of the bag. 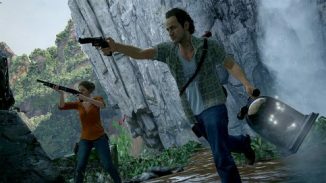 The game has won countless awards and most of them are for the voice acting or the audio direction. I’ll not waste any time and start off by saying that these were all well-deserved. 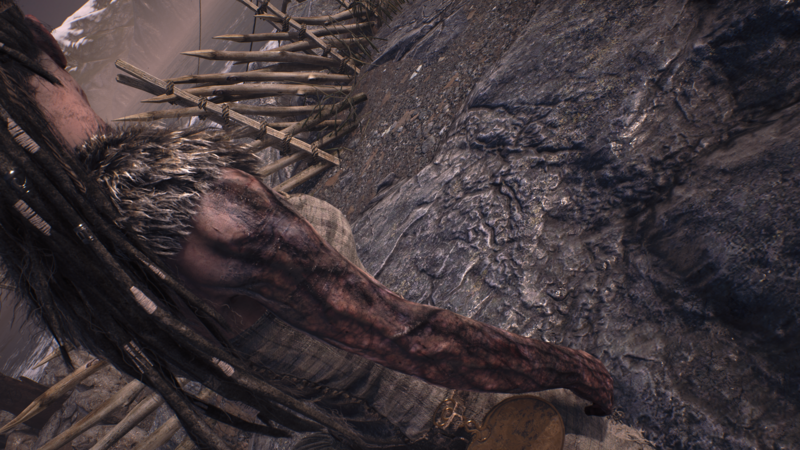 Rarely has a non-rhythm game managed to grab my attention as well as Hellblade has with its various audio elements. 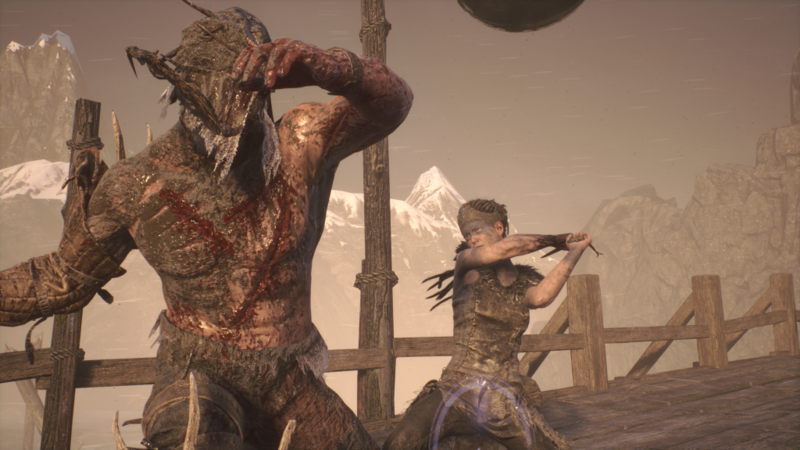 The voices Senua hears throughout her adventure are exceptionally well cast. While some of them offer guidance, there is a lot of strife among them. It chills my spine realising this is a real affliction people suffer from, hearing judging voices cast down on you with your every action must be extremely tiring and would drive even the strongest minds insane. I always found myself to be put at ease on the rare occasion they were spurring me on. There is also a booming demon-like voice of which I won’t spoil the owner, but the bass frequencies used here shake my very core. I played through the entire game with a high-quality headset on + a SUBPAC subwoofer backpack and let’s just say I wouldn’t want to play it any other way. Truly a unique experience which I would recommend to every gamer. The sound effects also need to be commended, when thunder claps or a wave breaks against the rocks on the shore, you can well and truly feel the impact. When the lights are off, you can easily believe yourself to be IN the gameworld and that’s about the summit of my gaming expectations: maximum immersion! I’ve found myself pausing more than once, just to take in the atmosphere. Yeah, I kept this one for moments when I can absolutely let myself be absorbed into its mindset. 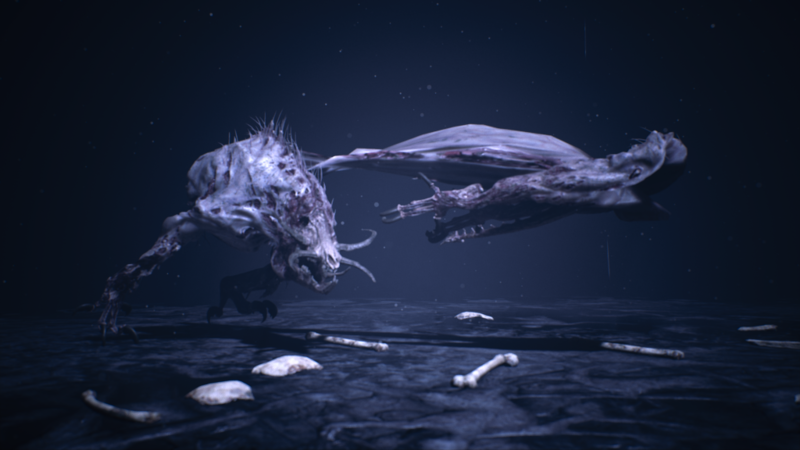 The included photomode can be triggered at almost any time so you can inspect the power of the Unreal Engine from up close should you want to. It’s actually quite amazing how you can trigger this even in cutscenes. I often found myself in awe how I could pan around in a scene that obviously had an ideal camera angle, yet I was given the freedom to look around. Though admittedly there were a few times this went awry. The beast… are you ok there, buddy? Visually the game holds up pretty well on the Nintendo Switch, especially when compared to the base console versions of the competition. It’s only when you put the game side by side with the PS4 pro or Xbox One X that you notice they have better textures, shadows and draw distance. Everything also looks to be a few shades lighter on the Switch and foliage especially is a lot less dense but there isn’t anything to really hamper the experience and the game runs at a smooth perceived 30FPS (I have no way to test myself). I do appreciate a larger screensize for immersive games like this one, so I opted to play the game docked for the most part. In handheld mode I also noticed everything to have a somewhat blurry appearance. 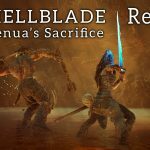 Hellblade Senua’s Sacrifice is an incredible audiovisual experience, regardless of the platform you are playing it on. While in handheld mode the level of immersion might be somewhat reduced, the audio is where it really counts and that aspect is every bit as good on the Switch as on the more powerful consoles. If you have yet to play this game, listen to the voices in your head and pick this up, you won’t be disappointed! 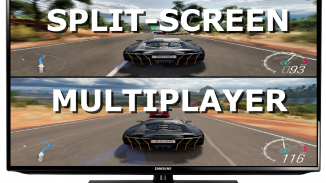 Could the Xbox Scorpio mark the return of split screen gaming?